As we head into Week 6 of the NFL season, it’s time to step back and take a look at players worth dropping in fantasy football. Dropping players in typical redraft fantasy leagues is a necessary evil. Most redraft fantasy leagues have shallow benches and smart fantasy owners are constantly churning over the deadweight in favor of future potential. Holding onto a player for too long just burns a valuable hole on your bench. Adversely, you don’t want to let a player go right before his breakout. These types of articles are often league and scoring-dependent, so to appeal to the masses, these are all going to be drops that I’d personally feel comfortable dropping in 12-team, PPR leagues. Your specific league and situation might be different, but these work as a general statement. The first-round pick for the Seahawks is currently third on the team in snaps, carries, and receptions. He’s simply not seeing enough opportunities to warrant holding onto your rosters anymore. 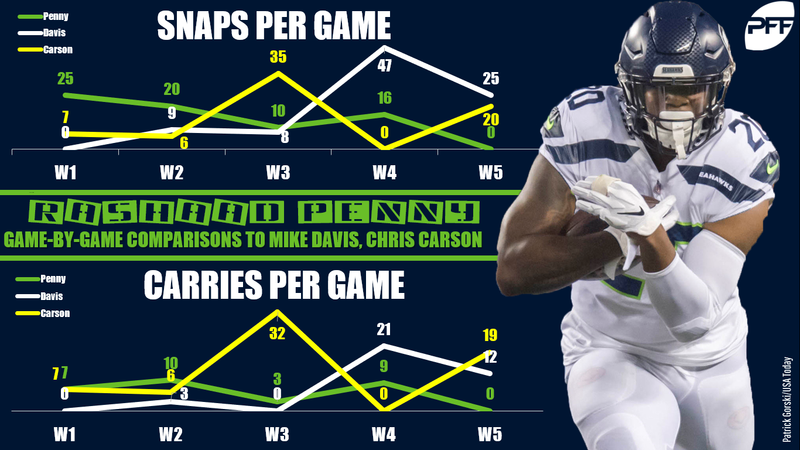 The combination of Chris Carson and Mike Davis may not bring a twinkle to your eyes, but as long as Pete Carroll remains enamored with this duo, Penny isn’t a player worth stashing. Since the return of Aaron Jones (Week 3), the Packers backfield has been split into a full-blown committee, rendering each player as risky weekly plays. Montgomery trails both Jones and Jamaal Williams in total touches over the past three weeks. If there ever was a week for Montgomery to emerge as a viable fantasy option, it would’ve been last week. When facing the Lions in Week 5, the Packers’ wide receiver depth chart was encumbered with injuries, providing one last chance for Montgomery to see some extended run operating out of the slot. Montgomery saw just three snaps out of the slot and Williams ran more routes than him (23 to 18). Don’t fret on cutting bait with TyMo. Like Montgomery, if there were a week on paper where you’d feel comfortable starting Henry, it would’ve been last week with the Titans six-point favorites by the time lines closed Sunday against Buffalo. The Titans continue to stick with a committee approach, limiting the fantasy ceiling of both Henry and Dion Lewis. Henry has been out-touched and out-snapped by Lewis despite an early winning record. With the Titans ranking bottom-five in red-zone trips per game, Henry isn’t seeing the touchdown volume nor receiving work (five targets in five games) to warrant rostering in typical 12-team PPR leagues. The Browns remade their running back squad this offseason, signing Carlos Hyde and drafting Nick Chubb to supplement Johnson. Hyde currently ranks second in the league in carries (100) and has played on 52.7% of the team’s offensive snaps. Johnson has seen his snaps drop from 53.0% last year down to just 41.9%. Through five weeks he has totaled 17 carries and 16 targets. The Browns front office changed this Cleveland offense quite heavily this offseason and it’s coming at the expense of Johnson. The injury to Jimmy Garoppolo saps much of the ceiling that Goodwin had this season. The former Olympic track star won’t have much of a chance to complete deep passes with C.J. Beathard at the helm. Beathard’s 5.8-yard average depth of target is far more conservative than Garoppolo’s 9.5. That should hamper much of the appeal of Goodwin (16.0-yard aDOT last year), with the two clashing in different offensive styles. Goodwin screams of the typical roster-clogger that you have difficulty pinpointing his good weeks and end up benching him instead. I’ll take the layup with the 48-year-old Marshall. He’s seen fewer snaps in four consecutive weeks and is coming off a seven-snap week this past week against the Rams. His targets are also trending down (6, 6, 2, 0). Whether due to injury or ineffectiveness (1.37 YPRR, 48% catch rate), Marshall looks to be a declining fantasy asset. Drop Marshall and instead try to make a trade for his teammate Tyler Lockett, who’s having an under-the-radar breakout. Hat’s off to you if you’ve kept Parker this far into the season, but after playing in just one game (2-40-0), feel free to let him hit the waiver wire. This Miami offense looks to have lost much of it’s mojo, currently grading as our No. 29 passing offense. After sitting out several weeks due to a finger and quad injury, Parker is reportedly on the trading block. Even if he were to join a new team, his pedestrian play to this point in his career leaves him as a better gamble on your opponent’s roster over yours. Ginn’s injury let young playmakers Tre’Quan Smith (3 catches, 111 yards, 2 TDs) and Cameron Meredith (5 catches, 71 yards) go off Monday night this week. In his prior two games (Weeks 3 and 4), Ginn combined for 3-12-1 on eight targets. That type of volatility is exactly why he can be replaced with an up-and-coming player and dropped from your roster. Ginn remains one of the league’s better deep-ball specialists and is best served as a streaming candidate in potential shootouts. The rookie was given a golden opportunity to make some noise for himself with Greg Olsen’s injury. After a quality preseason, Thomas has seen just 15 targets despite playing on 80% of the Panthers’ offensive snaps from Weeks 2 through 5, while Olsen was out. That’s netted him fantasy outings of 3.0, 5.0, and 6.8 PPR fantasy points. Feel free to drop Thomas and stream best available instead. Despite disappointing fantasy owners in four out of five weeks, there remains a reason for optimism regarding Hogan. He’s played on a whopping 91.0% of snaps and leads all skill players in routes run. He’s hauled in 11-of-17 targets, but just hasn’t quite seen the volume most were expecting heading into the season. The Patriots face a soft Kansas City secondary that just allowed Blake Bortles to throw for 430 yards. Hold Hogan another week and see if he can turn it around in what looks like a get-right spot on paper.